I can’t believe that Thanksgiving is just a couple of days away, but don’t hit the panic button yet. There is still some time to gather up a few pieces and put together a last minute tablescape that will have your guests feeling extra special. If you stick with neutrals, they can carry you into your next holiday gathering. Just by simply changing up the centerpiece and décor, it will look like a totally different tablescape. 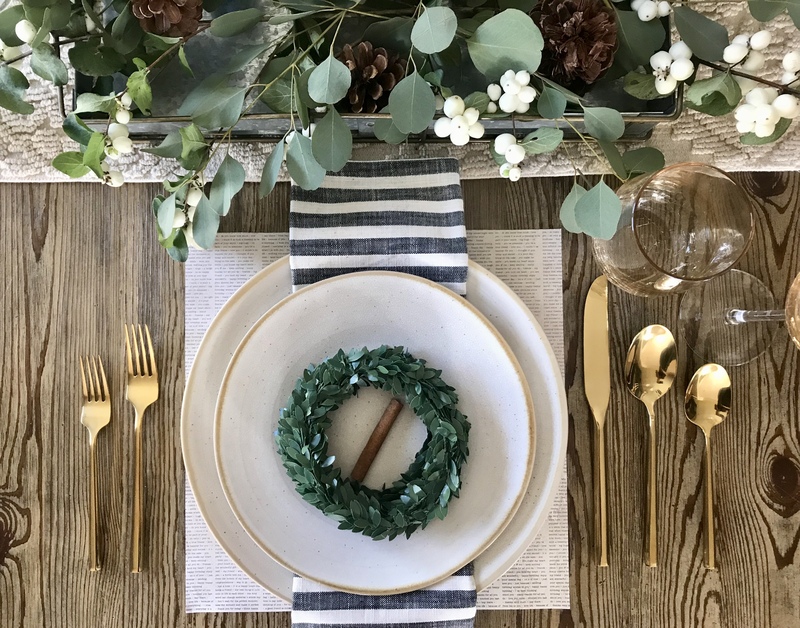 These neutral napkins by the Magnolia Hearth & Hand collection found at Target and this super cozy table runner from Pier 1 are sure to reappear on your table on any other festivities. Clear away for good conversation and opt for a low centerpiece. I love to incorporate florals; they not only add color and texture, but they also bring a softness to your look. Put them in vases or even arrange a quick and easy table garland by using silver dollar eucalyptus and that will do the trick. For this tablescape I decided to go with a small garland and arranged it on this lovely galvanized metal tray I found on clearance at Target again from the Magnolia Hearth & Hand collection. However, if you're lucky enough to have a lovely tray currently displaying on your coffee table or center ottoman, why not reuse what you already have. Candles or tealights always help make a beautiful scene. There's something about that subtle glow and flickering of light, that brings warmth and serenity to any environment. However, Thanksgiving is about families and with families come children, so safety comes first. Opt, for flameless (battery operated candles) such as the one shown here bought at Amazon. 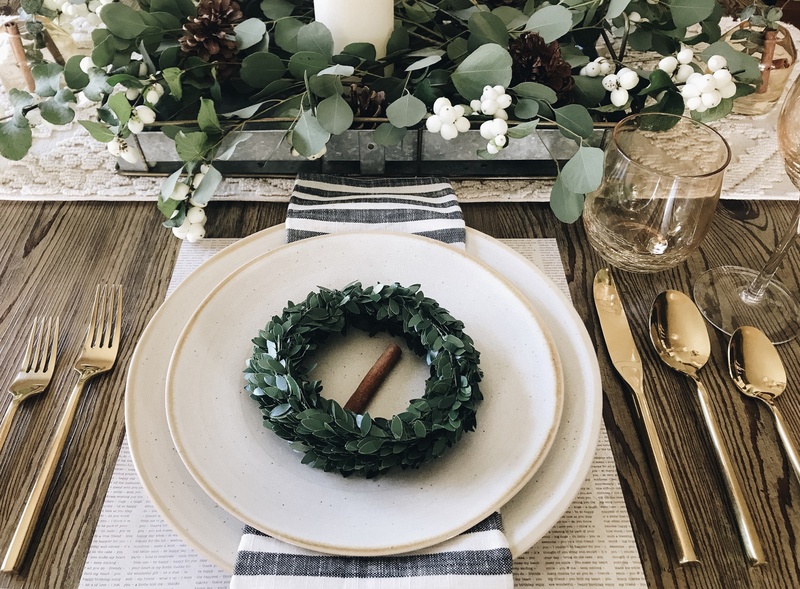 Mini wreaths are always perfect for dressing up your holiday table, they give each place settings a festive touch, and they can also be used to hold place cards if needed. Placemats? or No Placemats? 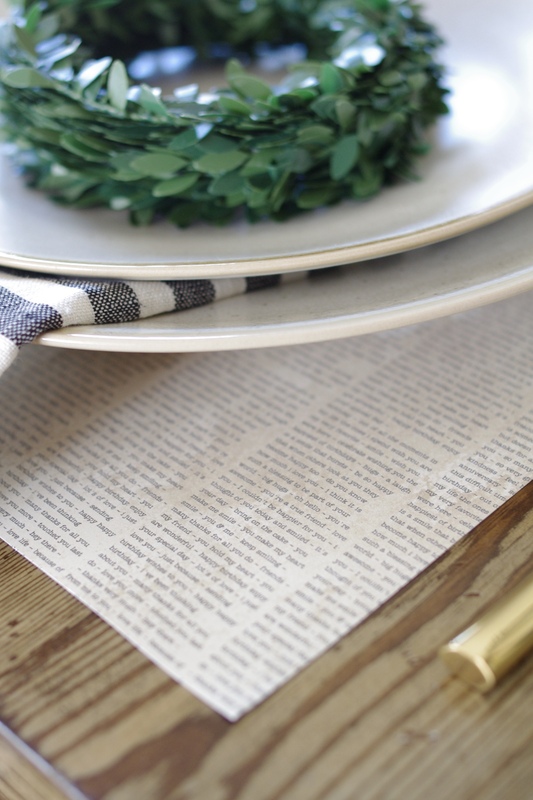 Layering items add dimension and interest to your table, but don't go spend the extra time and money, finding the perfect ones and instead create your own paper placemats. I found these 12" x 12" scrapbook sheets at Michaels by Recollections and loved the tiny prints of sentimental notes such as "Thanks for all you do", "I couldn't be happier for you", "A laugh is a smile that bursts" and many more that I'm sure your special guests will enjoy reading. I hope you gathered a few ideas from this tablescape to add to your Thanksgiving table this year. And remeber to always be thankful for what you have and for the special people who surround you. May you all have a happy and blessed Thanksgiving! © 2018 Willow & East. All rights reserved.